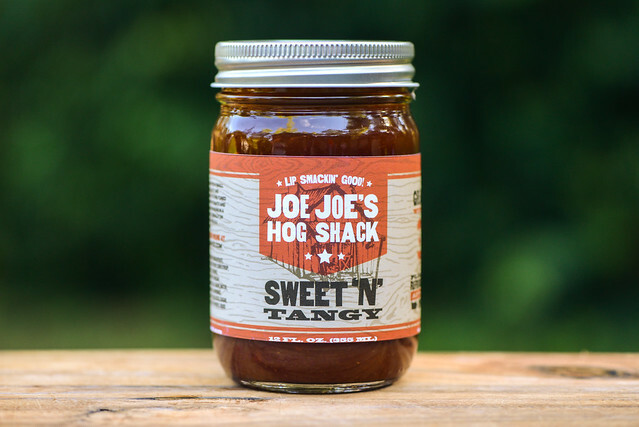 Quality ingredients that combine into a standard barbecue profile with a little extra tang and heat make Joe Joe's Hog Shack Sweet n' Tangy a sauce that will serve your grilled and smoked meats well. 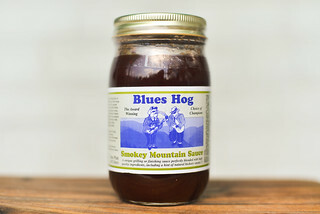 Joe Joe's Hog Shack is fairly new to the scene, having only officially launched their line of three sauces in late spring 2016. The venture is a family-run outfit between Brian Ellis and his father-in-law, Joe Flanagan, who's been working on his sauces for years. 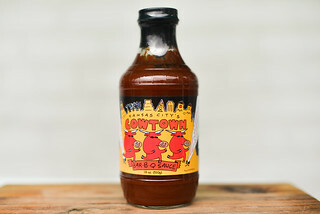 They're based out of Glenwood, Maryland and focus on unique sauces produced in small batches that feature quality, recognizable ingredients. A ketchup whose sweetness is interrupted by Worcestershire sauce and vinegar is the dominant aroma in this sauce. It creates a profile that's complex and tart with a bright, fruity tomato smell that's only mildly sweet. Upon deeper whiffs, there's background notes of garlic, onion, and liquid smoke, which all combine to further enhance the fairly standard barbecue aroma. This smooth, maroon sauce is semi-glossy and semi-transparent, which makes it easy to see the plentiful small red, black, and white spice specs, along with the occasional larger white bits of spice as well. Its consistancy sits just south of medium and it flows in a fast, uneven pour off a suspended spoon. Most of the sauce releases in seconds, but once the majority has fallen, what remains slowly drips off, and finally ends with a medium coating left clinging to the silverware. First taste of this sauce is mild, with a mellow sweetness and light tomato flavor. As the sauce settles on the tongue, first a mixture of Worcestershire and molasses give the sauce depth right before the vinegar hits, which starts with a slight tang that builds, reaching a very acidic crescendo, at which time a medium heat is unleashed. This leaves a final aftertaste that's primarily spicy and tangy, with a diminished tomato sweetness still lingering and minimal smokiness. The sauce coated the chicken in an even, medium-thick layer that baked down well over indirect heat. When moved directly over the flames, there was a little burn off along with some nice caramelization. Cooking the sauce really brought out the molasses flavor, which graduated from its supporting role to a main player. While the molasses was amped up, the overall sweetness was not, which let the tanginess remain along with the heat, which built up nicely upon multiple bites. The complexity also persisted, but to a lesser amount—Worcestershire continued to do its part, but nuances in garlic, onion, and earthy pepper were a bit lost to the overall bold and robust barbecue flavor. 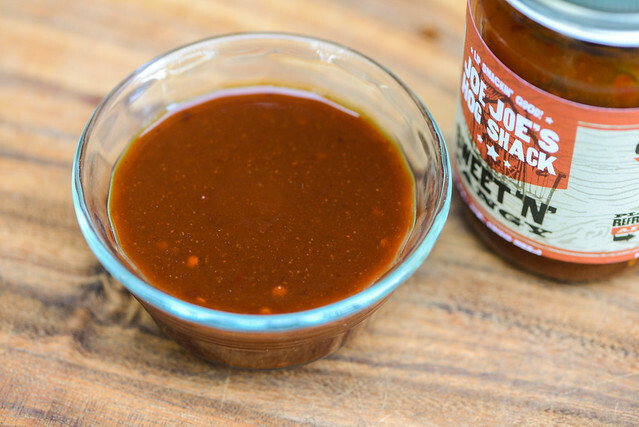 Joe Joe's certainly hits the right barbecue notes and has enough complexity and nuance to make it an above average sauce. You get your tomato, molasses, tang, and heat in a pleasing progression both out of the jar and after being cooked. You can also definitely taste that this a quality product, comprised of ingredients you'd probably pull off the grocery shelf yourself. 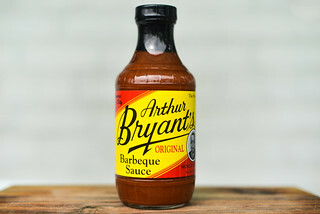 Even though it deserves those praises, for me, it was missing that special something that pushes sauce up to the next level beyond standard barbecue. 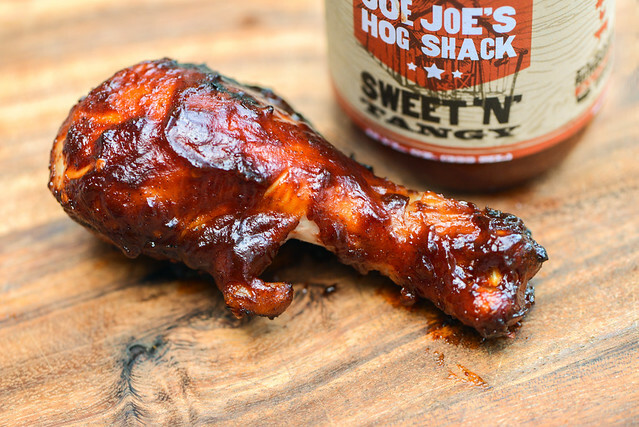 You aren't going to go wrong slathering your chicken, ribs, or almost any meat in Joe Joe's Hog Shack Sweet n' Tangy—it will result in really delicious, crowd pleasing barbecue, but may just fall short of standing out in crowd. I'm sure as Meatwavers, Labor does not signify the end of grilling season and you're ready to keep tending the flames and need some quality sauce to help you out. Luckily, Brian sent along a second bottle of this sauce to give away to you for just this purpose. If you'd like to be entered to win the sauce, all you have to do is comment on this post with your best bite from this past Labor Day weekend (hopefully grilled or smoked, but doesn't have to be). Deadline for entries is 11:59pm on Tuesday September 13, 2016. Read the official rules for more details. One entry only per individual. Good luck! Grilled Yellowfin Tuna tacos with a watermelon salsa.